Who says you can only camp during summer? Even as the days get colder and shorter, camping is still an enjoyable and exciting activity for the whole family. Add the fact that you get to avoid the crowd and appreciate nature in a truly peaceful and relaxing manner. First thing’s first – you want a comfortable and warm place to spend the night at. Choose a sleeping bag that protects against very cold temperature (lower than you expect). Consider bringing a mattress pad or foam for an extra layer of warmth and comfort. When choosing a tent or shelter for fall camping, never skimp on quality. The fall season is characterized by fluctuating temperatures. You may feel like you can tolerate the weather at 6 pm but then end up freezing at around 9 pm. Look for a four or five-season tent. It’s great at keeping heat and has an ideal structure against rain or snow, as water can easily run off the top. A tarp is one of the most helpful, versatile camping gears that you should not forget to bring on your next camping adventure. If you’re like other campers who prefer a swag over a tent, you should set up a tarp to keep the rain and snow out in a downpour. Even if you’re bringing a tent, a tarp makes a sturdy cover against heavy rain or snow. It is also a great tool for covering your gadgets and equipment, such as cameras, laptops, radio, etc. The last thing you want to happen is seeing all your stuff drenched in water. Additionally, you can use it to block wind at your campsite. Windy days at the campsite are less than ideal. Hanging a tarp from trees can block some of that. Choose a heavy-duty tarp with grommets for easy setup. Layering is the key to keeping warm. A three-layer system works fine this autumn unless you will camp at a very high altitude where four-layer clothing is necessary. Pack some waterproof, breathable clothing. You may also need to bring a few extra clothes. Be sure that your sleeping outfit is loose-fitting and clean. Tight clothing can restrict blood flow and allows dirt to easily clog, reducing insulation and thus, making it harder to stay warm. Don’t forget to pack a few extra pairs of dry sleeping socks. Even a slightly damp sock can cause you to lose body heat. Furthermore, wear a knit cap to bed. About 50% of heat is lost through your head if it’s the only part of your body that is exposed. Other items you should pack are leather gloves, extra shoes, thermal underwear, and a winter jacket. Summer camping calls for refreshing light meals like fruits and sandwiches. But fall and winter camping require heartier meals. Eating is a great way to keep your body warm. Choose filling and warming foods like canned soups and stews. Foods that are high in protein are perfect for fall camping. Pack some nuts, meat, veggies, and carbs (whole wheat bread or cracker). Don’t forget to bring some of your favorite hot beverages – coffee, tea or hot chocolate. And yes, you definitely need a dessert. Sweet treats warm the body too! And don’t forget to bring plenty of clean, drinking water. You need to stay hydrated. Choose foods that are easy to prepare in case weather conditions prevent you from cooking. Bring firewood too. It can be difficult to find some during the cold season. It’s either summer campers have already scavenged the forest for firewood, or the rain and snow have made most of the wood too wet to burn. Putting up a campfire will definitely help keep you warm at night and makes cooking more enjoyable outdoors. Last but not least – you should be prepared for any emergency. Whether it’s a simple cut, a stomach ache, a skin rash, or a sudden illness, you want to be able to address the problem immediately. Your first-aid kit should include basic care items such as disinfecting wipes, antibacterial ointment, bandage, sterile pads, gauze pads, pain-relief medication, band-aids, biodegradable soap, hand sanitizer, cotton balls. Don’t forget to bring mosquito repellant! You absolutely need it. A multi-tool with a knife is a camping essential too. And another thing – packing some Ziplock bags and plastic bags come in really handy. You can keep items like toilet paper, medicines, and matches in Ziplock bags, and your wet clothes in regular plastic bags. There you go – the five most important camping gears and must-haves this fall! Fall camping is an absolutely fun idea. Most of the time, it’s just going to be you (your company), the stars, and the beautiful landscape in front of you. The autumn season makes an ideal time for campers who want to skip the crowd and enjoy outdoor activities in a cold weather. However, there are some safety precautions you should take to ensure that you have an enjoyable camping experience. The fluctuating (and often unpredictable) weather is your biggest enemy. Thus, you have to equip yourself with the right gears to stay warm. 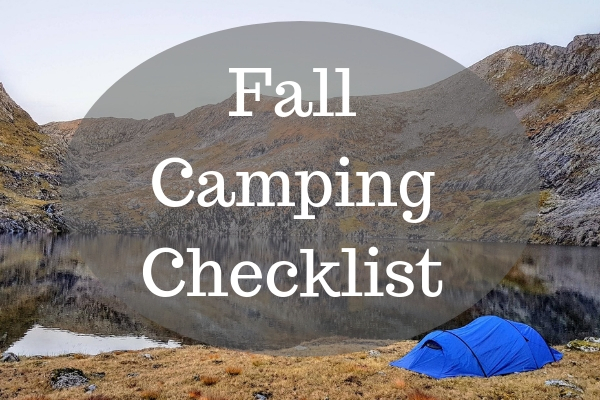 In this post, we highlighted the five most important camping essentials for fall, from the sleeping bag and shelter to the tarp, clothing, food, and supplies you need. The key is to plan ahead and be prepared, especially if you’re taking your kids or pets with you. They may need additional attention and supplies to stay warm. Depending on how much longer you wish to stay at the campsite, you may need more or less of the items above. Before you pack, list down all the items you need so you don’t forget a thing.